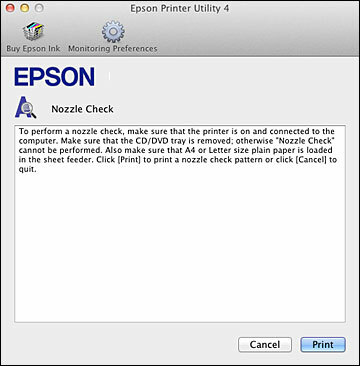 You can check the print head nozzles using a utility on your Windows or Mac computer. Mac OS X 10.4/10.5: In the Apple menu or the Dock, select System Preferences. Select Print & Fax or Print & Scan, select your product, and select Open Print Queue or Print Queue. Select Utility. If there are no gaps, click Finish. If there are gaps or the pattern is faint, clean the print head.